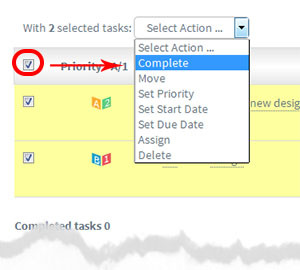 Select and change several tasks at the same time. This simple feature lets you select several tasks and edit them all with one action. Simply click on the checkbox in the list header. This selcts all the tasks visible on the screen. Then use the “Select Action…” drop down. Use the Task Screen Filters (see here) to narrow down the task groups you want to multiple edit. For example Click on the header “Date” to select all the overdue tasks overdue and change their due dates… and so on.